The long driveway had no turn around space. This minor every day nuisance became a major inconvenience when guests dropped by. The house, sited mid way up a side sloping lot, lacked a defined entry area. There was no “front yard” as such to frame the house. Views of the home were obscured on approach by random shrubbery and scrubby trees. 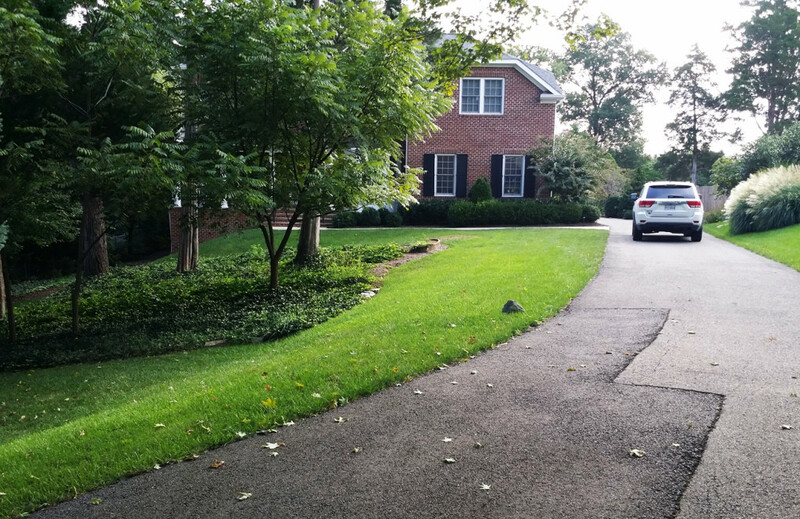 The solution to the first problem –the need for additional parking and a turnaround area- became the anchor for this front of home landscape design. The driveway couldn’t be widened because it was too close to the property line. So, the only logical location for a parking pad required filling and leveling the slope near a small grouping of cedar and black walnut trees. Immediately up hill from that spot, the architect’s plan specified additional fill and leveling to create a more welcoming landing at the front of the house. These changes in grade are held together by retaining walls and steps. A curved retaining wall follows a line along the new front walkway connecting the front entry to the parking pad. So, the landscape architect found an interesting way to resolve the functional problem (parking) while improving curb appeal of the house. 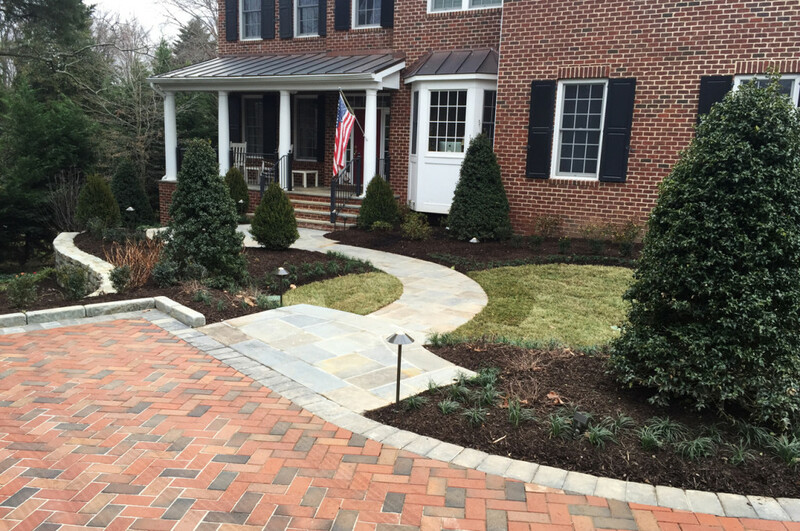 The client and architect worked together to get the right feel for the front yard plantings. 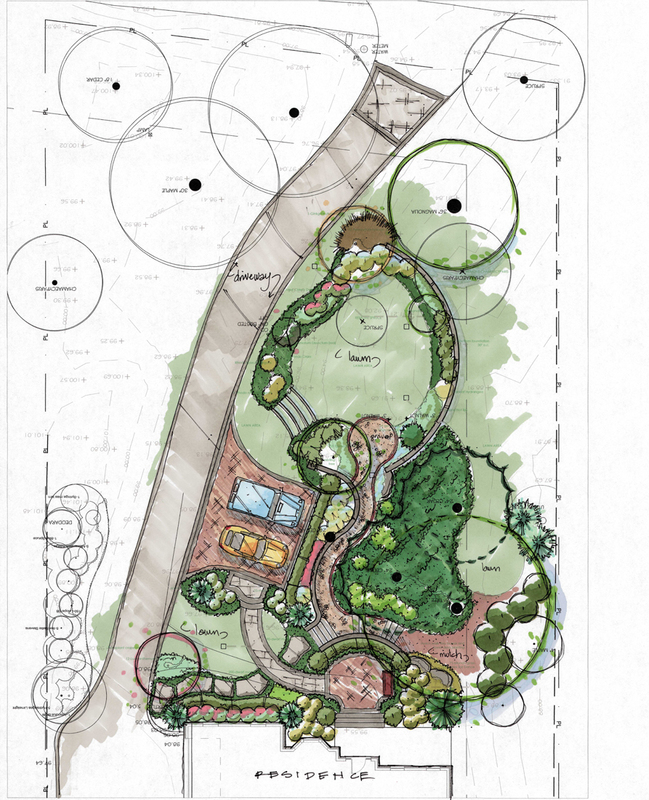 The client wanted her front garden to have a loosely arranged collection of flowers and plants—less studied in appearance than what was shown in the original plan. They accomplished this by installing smaller groupings of a wide variety of different plants. They implemented a mix of colors and different seasonal blooms for the design. The client is particularly fond of “cut flowers” such as daisy and aster because she likes to bring fresh flowers into the house. They also chose species based on how they look when they aren’t flowering, for their contrasting leaf shapes and textures as well as variations in shape and height. 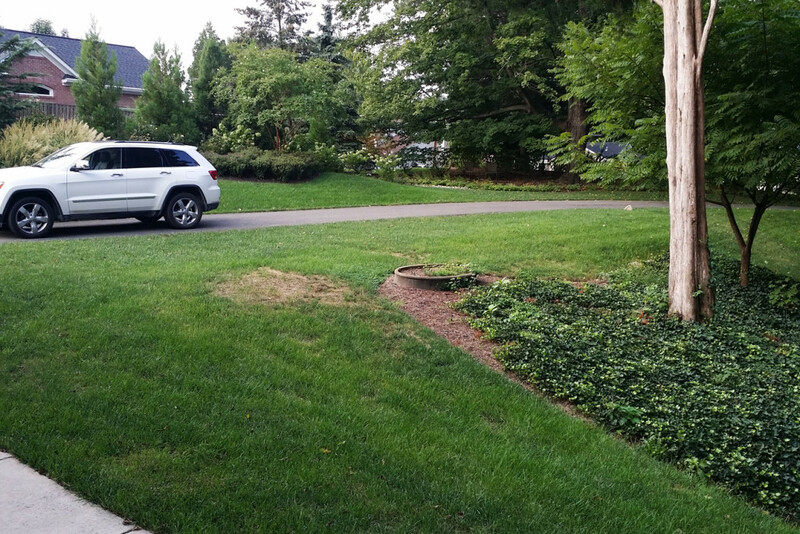 In the planned part of the landscape design process, we filled and leveled sloped areas to gain maneuvering space for cars; and we created visual interest by following the contour of the slope with a retaining wall and walkway. An improvised addition to the plan involved relocating a young sycamore tree. The architect noticed a tree near the property line that was, as the client put it, “just there.” The architect said it was going to grow to be very tall. It was already about to interfere with the power lines. He suggested moving it before it got too big and deliberately including it in the new landscaping plan. That lone sycamore wasn’t connected to anything before. 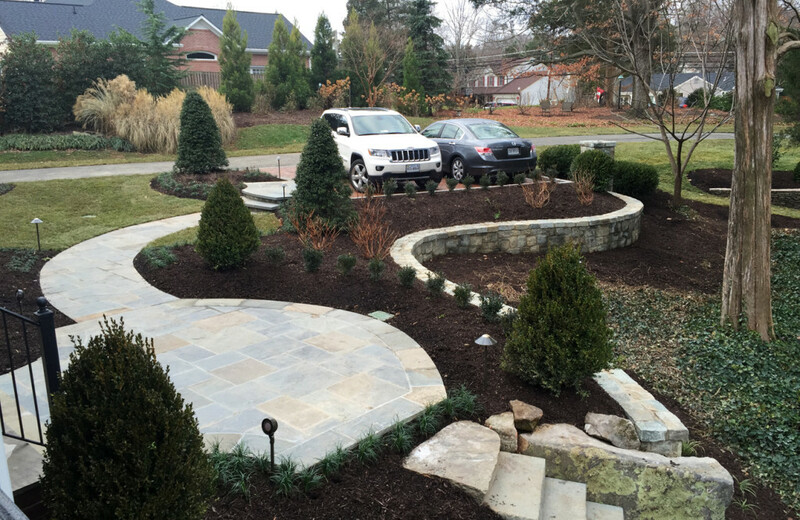 Now, the client says it is an anchor point in the landscaping. This kind of thinking is characteristic of a good landscape architect and a good landscape design firm. It results in a well thought out site plan that resolves functional problems with artful solutions. Plus, it takes best advantage of assets found on site by weaving them into the design. It strives to fully understand the landscape in relation to the client’s wishes before making plans to change it. Front of home landscaping can be tricky because of limited space or awkward grading. If you’d like talk about making the approach to your home more welcoming, please feel free to contact one of our landscape architects.